Taller than double crochet, treble stitch creates long openings between stitches and produces a very loose fabric when worked. It’s an important basic to know when learning crocheting techniques as once mastered, it can be combined with other stitches to make more interesting stitch patterns. Treble stitches are very versatile too - they can be worked in a number of different ways to make triangles, circles, squares and other shapes. The Knitting Network's Freddie Patmore will teach you how to get to grips with treble in our video below. 'Trebles aren't as daunting as they sound, they simply refer to the group of crochet stitches that work with additional loops of yarn around your hook before you work into your chain or fabric, respectively,' she explains. Make a ring of three chains so you’re the same height as a treble before you start working downwards into the small ring. 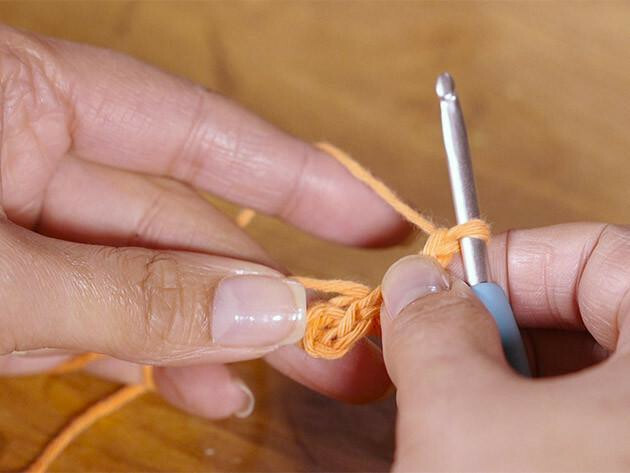 To work the trebles, begin by taking a loop of yarn around the back of your crochet hook. Angle your hook downwards and poke it through the chain ring. Get another piece of yarn and take it through the chain ring being careful not to catch any of the yarn around the edge. That gives you three loops, hence the name treble. To finish your treble, simply work into these loops two at a time. So take one loop of yarn through the first two and then another loop of yarn through the final two. If you’re working into a chain ring and doing trebles in this way, you will find that you create a circular shape. As you continue to work trebles into the ring, the shape of the circle will start to form. If at any point you’re struggling for space on your chain ring, simply shuffle your trebles around to make room for the final stitches. To finish your circle, do a slip stitch into the third of the three chains from the beginning of the round. Fasten it off by taking the end of yarn though the loop that’s on your hook.